A lot of novice photographers are confused when faced with the option to choose the type of digital camera that will be used for the first time. The starters are confused when looking at an example of this type of camera is compact-system cameras, prosumer cameras, mirrorless cameras, professional cameras or digital SLR cameras. Many of them are also subject to the influence of competition between Canons versus Nikon, the two biggest names in the world of photography. If you insist to choose a digital SLR camera, then you can choose the type of entry level. You can buy a full frame camera in the future, when you already have a big budget, so you are not dizzy when you need an extra lens as a telephoto lens, macro, wide angle lenses and other accessories. Although many prosumer cameras or mirrorless camera that has had a variety of advanced features as the Digital SLR cameras, but still want to try the beginner DSLR cameras and they are stuck in between the major brands, Nikon and Canon. Actually, you can choose other brands such as Pentax cameras, the Sony Alpha DSLR camera or even manufactured by Sigma and Leica. Why you should choose a Nikon or Canon? Well, because Nikon and Canon had a major influence on the novice and professional photographer, so on this occasion we started it compares fairly new camera, the Canon EOS 700D and Nikon D5300. Nikon D5300 is an upper entry-level DSLR aimed at photographers looking for a step-up from a budget model without the expense, size and complexity of a higher-end model. This camera comes just less than a year after the D5200, but Nikon makes some important upgrades including becoming the first Nikon DSLR with built-in wireless. Nikon D5300 features bigger sensor plus more resolution compared to Canon EOS 700D. When compared with its predecessor, the D5300 showed similar results in terms of dynamic range and color depth with a slightly increased ISO sensitivity. Compared to its direct competitors, the Canon EOS 700D and Sony SLT Alpha 58, test results indicate that Nikon D5300 is 1/3 stop better than EOS 700D when it comes to image quality. Nikon D5300 features 24.2 megapixel DX-format CMOS sensor, using the same sensor as Nikon D7100 many people said that the image quality of Nikon D7100 is better compared to Canon 700D. 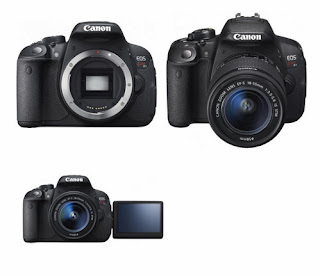 The Canon EOS 700D or called Rebel T5i replaces the Canon EOS 650D / T4i, but is almost indistinguishable from it in terms of design, operation and specification. The image quality and performance of both cameras to be identical and they use the same batteries and accessories as well. Canon 700D produce detailed images with low-noise 18 megapixel sensor, that can be printed at high resolution and cropped without losing quality. You can capture Full-HD movies with creative control and Hybrid CMOS AF that focuses continuously as you shoot, so you can use Canon 700D to create high quality video clip or movie. You will enjoy Canon EOS 700D features: The 'HDR Backlight' and 'Handheld Night Scene', modes combine multiple exposures to give a final processed image. A four-exposure 'Multi Shot Noise Reduction' setting is also available in the PASM modes. Nikon D5300 have 39-point autofocus system, with 9 cross-type sensors. Canon 700D comes with 9-point all cross-type AF system (including a high-precision dual cross f/2.8 center point). You can shoot any moment with Canon EOS 700D and you also can explore new shooting angles and control the camera with a 7.7cm Vari-angle Clear View LCD II Touch screen. The D5300 also offers a beefed-up video mode, which is now capable of true 1080/60p HD video. This, plus the slightly enlarged (3.2in compared to 3in) fully-articulated 1.04 million-dot LCD screen should mean that the D5300 is attractive to videographers as well as stills photographers. 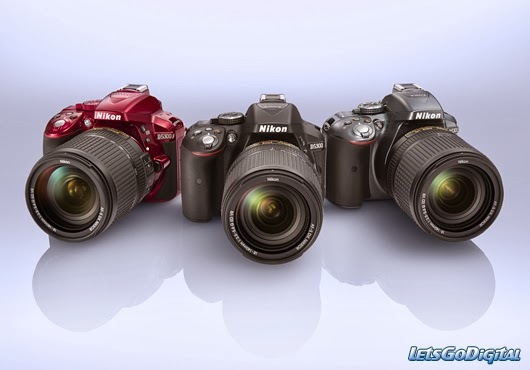 Nikon D5300 also equipped with built-in Wi-Fi and GPS - both firsts for Nikon DSLR lineup. You will love the Wi-Fi connectivities because make you easy to share your photos to other device. The Nikon D5300 is rather smaller than the Canon EOS 700D/T5i (the larger kit zoom mounted on the Nikon in this shot makes that a little hard to appreciate) but has a slightly more substantial hand-grip which contributes greatly to its feeling of solidity in the hand. Generally, Nikon D5300 makes fantastic quality images and weighs almost nothing, so it's a pleasure to carry it everywhere. Compared to the pro cameras I often haul, the D5300 feels as if it's hollow, which is a very good thing. Canon EOS 700D also can create great pictures and easy to carry anywhere such as for holiday in Bali and other unforgetable moment such as wedding party, family reunion, birthday party, adventure and other social or business activities. Before you make an important decision, don’t forget to compare these sophisticated cameras with other brand such as Sony Alpha, Pentax K-3 or Panasonic GH-3. Nice to know you have segregated points of both cameras. what is the conclusion/summary of this article. i am new to DSLR, but i dont want to take entry level or just inferior camera. reading your blog didnt help in deciding which one i should take. Also have you used any or both of these camera? if not then you should mention that as well.